Design A Frame has been around for quite some time, but we are still getting some questions about it. So what we did was come up with a fool proof info graphic that goes through what Design A Frame offers and how awesome it really is. Almost any size can be entered into Design A Frame with a click of a few keys. You can not only get a single mat but you can also get a double and a triple. You won’t have to worry about buying hanging kits, all Design A Frame orders come with them! You don’t have to worry about printing your image, Design A Frame gives you the option to make Frame USA Employees print it for you on super nice high quality paper. Design a Frame gives you three choices of glazing, not just forces you to choose the most expensive option! 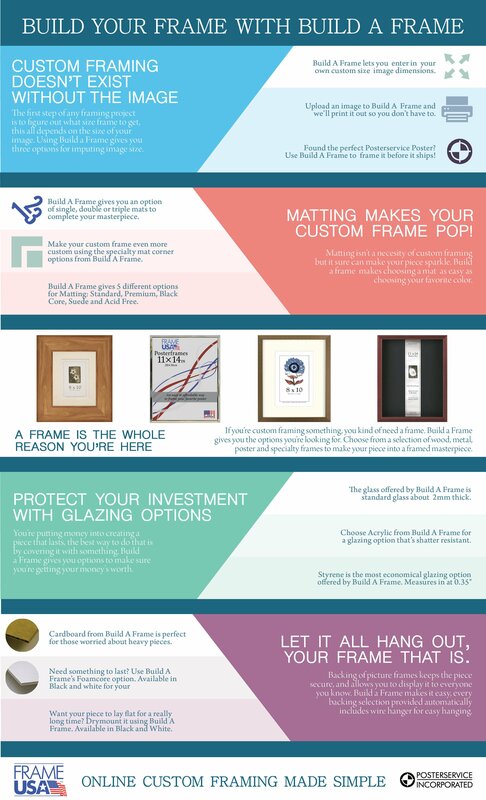 Design A Frame lets you have a custom framing experience that you desire, stick to the basics or go for the gold either way Build A Frame is a winner. So begin designing photo frames online with Frame USA, our website is your one stop shop for online frames! wanting to replace 2 frames that are 26.25 length X 8.25 width. My pictures are landscape oriented and include 3 photos with matting. pictures are 4X6. Frame is hung horizontally.